At Peddle Thorp, we recognise that every project demands a unique response to a particular set of issues. The practice's solid skill-base is built upon a wide range of architectural, interior design, urban design and planning experience. Our starting point is always to understand you and your goals. We draw on our experience and creativity to augment and add depth. We adeptly respond to your changing needs or project conditions to find design solutions. We commit to your project, at every step. You have a particular outcome in mind. While we are not mind-readers, we are the next best thing: attentive listeners. Sit down and meet with us and you’ll see – we pay attention and grasp context and subtext quickly. We will read and re-read your brief, gather more information and seek further insights. We consider the building as well as your organisation’s vision and how we can enhance your operation, branding, and reputation. We pull everything together in a revised and comprehensive brief that articulates our understanding of what you need, and incorporates our expertise on the most effective ways to achieve your goals. We are renowned for being both sensitive and strategic – we know you have deliverables, budgets, complicated stakeholder groups – but you also want a building that stands apart and exceeds expectations. - Mr Michael Green, Former Manager Capital Development, BlueCare. Informed by our robust brief, we start to develop ideas. We explore the possibilities: start sketching and thinking about the big picture. This crucial stage is when the details start to emerge. Depending on your project we may begin by collecting background material to support master planning, or identify stakeholders and start running user group workshops. We also engage with specialists such as: engineers, town planners, builders and cost planners. We gain a thorough understanding of the site. By investigating the site’s strengths and restrictions, we can consider how to best address the building location. We’ll brainstorm the various ways people will use the building in daily life and start developing conceptual drawings that show the basic shapes and forms – and how everything fits together. We will investigate planning and performance needs and identify any hurdles (like town planning applications) we need to clear so the project can progress smoothly. We continue to refine our ideas, based on your feedback, until we reach agreed way forward on the design direction. We develop an impressive, realistic design that showcases how your building will look and feel in the real world. In order to refine and resolve the design, our team produces more accurately drafted designs and 3D images that specifically define building features including: exterior design, details of the elevation, distinct rooms and facilities, how furniture and fittings might appear, exteriors and car-parking. We use our advanced knowledge of building information modelling (BIM) to create digital designs and may also create animated visualisations, models or virtual reality walk-throughs depending on your needs. We work with you to make decisions about the materials to be used. We coordinate with engineers and others in the project team to ensure all functional features like power, communications and environmental conditions are planned for, so that your building operates as intended. We integrate all operational modelling into our 3D models and resolve any issues, as well as revisit the building footprint and costs. All this work helps enables the creation of construction documents that builders will use throughout the construction process. To construct your building, many different people and disciplines must work together, with precision and efficiency, to produce a quality outcome. We can coordinate this process to ensure your vision is realised. 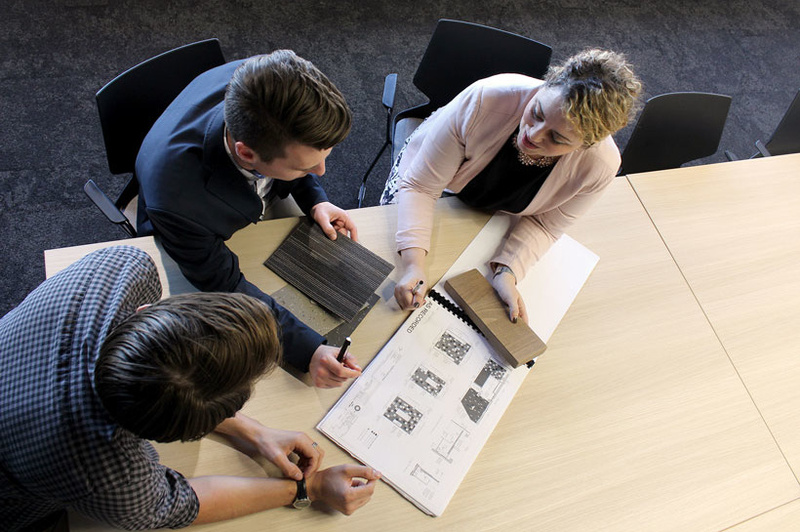 Peddle Thorp brings: an intimate knowledge of your brief and vision; knowledge of design; and a firm grasp of the nuts and bolts of construction processes. We are best placed to oversee the work of turning the virtual into reality. We capably manage people: competently guiding the work of multiple layers of engineers, builders, contractors and sub-contractors, with a friendly and collaborative temperament. Whether you ask us to co-ordinate construction or not, we’ll stay abreast of the build to ensure the details of the design are accurately conveyed, in order to deliver what you want to achieve: both physically and intrinsically. … The architectural design is outstanding. This very creative team were an absolute pleasure to work with; they embraced us and the culture of our service. - Ms Daniele Doyle, General Manager, Holy Spirit Northside Private Hospital. Your building is designed with sustainable design principles in mind, therefore reducing operating costs. The materials used have a strength and quality about them, having been selected for durability and lasting style. Our expert and consistent use of Building Information Modelling means that you’ll have access to comprehensive electronic data that can guide your facilities management, allowing you to optimise building performance and maintenance. Many of the people we work with are long-term, returning clients. That’s because our process is clear and thorough, our team is talented, our contribution is valuable, and our projects are successful. Understanding the lifetime costs of a building What does sustainable design mean to Peddle Thorp? Contact us to talk further about your potential projects.